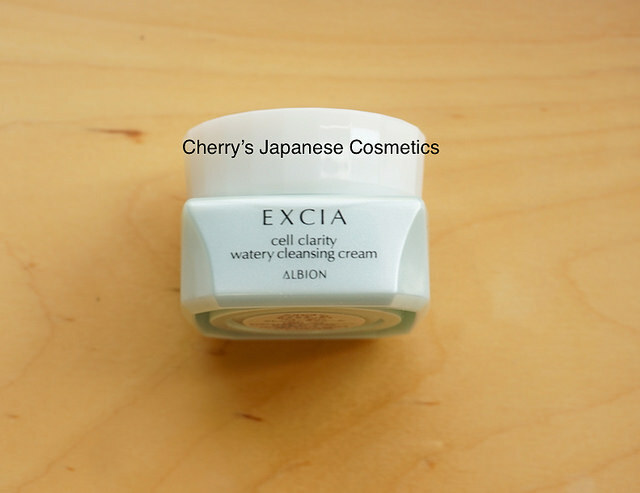 Let me (Cherry) review products of Albion Excia AL Whitening Mini-bottles Set, obtained as the selection kit SS2017. In this year of SS2017, they changed the formula of the makeup remover from Excia AL Circulating Watery Cream to Excia AL Cell Clarity Watery Cleansing Cream. My everyday makeup includes waterproof sunblock, waterproof eye makeups, eyeshadow and lipstick. I must say that this cream removes makeup every well, and leaves a refreshing scent. The consistency is quite good and it spreads easily on skin. I usually remove the residue of this makeup remover with tissue and my face feels clean and soft afterwards, not very oily. I’m used to cleansing oils but after using this cream based makeup remover, I must say that it works quite well too. I guess there will be a spatula for the full bottle, but there are nothing in this mini bottle. When you touch just few times, there are nothing changed. In the bottom of the picture, there are something pink, it is from cotton. They look the nothing is left, and the skin is really oily. I never recommend you will finish in this stage. It is really bad hygienic and bad for your skin. Wash your face gently with your favorite face wash.
After my face wash, I satisfied with this remover. There are some makeup removers, liquid (sometimes described as water), oil, gel, milk, cream etc. My recommend for the person who often makeup (like me) is oil or cream. So far, I have not seem the products of others who can remove clearly like this oil or cream. There are perfume too. If you are liking the things without perfume, this is not for you. If you don’t have any problems with scented skincare or makeup, guess this one has a very faint scent that is not overpowering.